IPL 2019 auction results will be updated here. The 2019 IPL will be played from either March or April 2019 and will go on till at the most mid-May before India leaves for the World Cup. What this early season of the Indian Premier League means is that the VIVO IPL player auction which is usually held in the year in which the IPL is played, will be hosted in December 18 2018 at Jaipur. The event will begin from 2:30 PM IST and end by 9:30 PM and will be broadcast on Star Gold UK. The event will also be broadcast live on Hotstar. This year’s IPL auction will not be as grand as the previous season given that teams have been allowed to retain most of their players but it doesn’t mean it wouldn’t throw up some interesting combinations and selections. Teams like the defending champions Chennai Super Kings have retained all but three of their players. And now they are left with just two slots to fill during the auction and they can be expected to go through the auction almost unnoticed. And while the Mumbai Indians have a few more slots to fill up, even they have retained a good core of their squad from the previous years, allowing them to build on the squad they had. The team to watch out the most during this auction is Kings XI Punjab. Punjab’s performances in the recent seasons of the Indian Premier League haven’t been the best to write home about but given the change in their coach, they will look to change things around on the field too. Mike Hesson, their new coach, has been one of the best in the world and will look to guide Punjab not just on the field but during the auction too. Some of the top players who could feature in the IPL auction this year include Pat Cummins, JP Duminy, Mustafizur Rahman, Jaydev Unadkat, Alex Hales, Aaron Finch, Yuvraj Singh, Axar Patel, Brendon McCullum, Corey Anderson, Mitchell Starc, Jason Roy, Mohammad Shami and Glenn Maxwell. Each of these players along with a host of other players who want to feature in the competition will set their own base price depending on whether or not they are capped players. 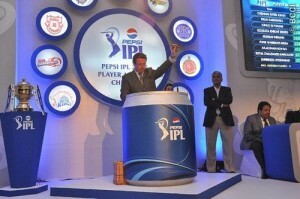 The entire list of players available during the IPL auction will be updated here before the start of the auction. Some of the biggest names in world cricket will change hands for huge amounts of money during this auction as teams try and put together a winning combination of players. With so many other T20 leagues around the world using the same model for their auctions as the IPL do, it is clear that this is a success and we can’t wait to see what happens during the 2018 IPL auction. The complete VIVO IPL 2019 player auction results will be placed below. The IPL auction will take place on December 18 2018. The auctioning off of the players is one of the things everyone gets excited about, but there is a serious side to this for both the clubs who are bidding and the players. We are going to see many new players available for auction in 2019, which is going to make for a hugely exciting auction, just how many players remains to be seen based on the format the IPL goes with. As soon as those plans are revealed by the BCCI we will bring them to you, explain how things will work and give you the lowdown on this page. All in all, it sounds like it will be an interesting auction to watch out in 2019 but more information on the IPL Auction 2019 format will be awaited as we get closer to the tournament. IPL Auction 2019 results will be updated above. My team n my best player is David Warne/ fron hyd. Rcb my 11 palyer virat . Ab. Dekock. AMAR SHERA KOLKATA KORBO LORBO JITBO RE ….